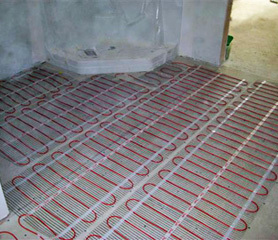 Electric radiant floor heating systems utilize heat cable to generate heat. When an electric heated floor is turned on, energy is forced through a conductive material (heat cable) to create resistance (heat). For most projects an electric line-voltage system is used. The thermostat used for a radiant floor heating system has an integrated GFCI breaker at the power source to ensure safety, and is available in 110 or 220 voltage. For heating small areas such as bathrooms or kitchens, electric under floor heating systems are usually recommended over hydronic radiant systems. In most small to medium-sized home heating projects, the advantages of electric systems are superior to hydronic radiant heat for warming floors. Electric floor heating systems feature much quicker response times, are easier and less expensive to install, and are virtually maintenance free. Are you looking for the best radiant heating system to install in your home? It's important to keep in mind that different radiant heat systems are designed to work best in certain applications. Therefore, no one should ever claim that there is a singular "best" radiant heat system for heating floors or for snow melting and so on. If any provider claims to have a radiant heat system that can be used for every application, then steer away from them. No one can legitimately make that claim. There are many factors used to determine what radiant heat solution is best for your particular project, including floor type, subfloor type, insulation, the region where you live, etc. ● Electric radiant heating systems are easy to install. ● Each room (or zone) is controlled separately by its own thermostat. ● Electric heated floors require no maintenance or upkeep. Learn about Low-voltage and Line-Voltage Floor Heating Systems.